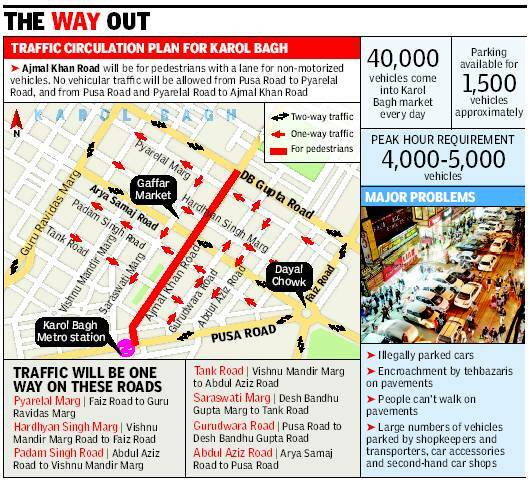 New Delhi:After dragging its feet on the Karol Bagh market decongestion plan for two years, the corporation has submitted a detailed design proposal to the Delhi government. The Rs 9 crore-project proposes to leave Ajmal Khan Road only for pedestrians and permit only one-way traffic movement in the market. “We have sent the proposal to the Delhi government as it requires major changes in arterial roads. The central verge will be removed and a single carriageway will be constructed with parking space on both sides. The project will not only ease traffic congestion but also solve the parking problem,” said Yogender Chandolia, chairman, standing committee, North Delhi corporation. Ground Situation At least 40,000 vehicles enter the area every day, say traffic police. While the available parkings can accommodate about 1,500 vehicles, the market needs to handle between 4,000 and 5,000 vehicles at any given point during peak hours. “Second-hand car dealers, auto repair shops, transporters and car accessory shops add to the huge number of vehicles parked in the market area every day by shopkeepers, shoppers and residents,” said joint commissioner of police (traffic) Satyendra Garg. This mismatch has resulted in alarge number of illegally parked vehicles on the main carriageway of various roads, and regular traffic snarls on Ajmal Khan Road and all connecting roads. Encroachment of pavements by tehbazaris has left little space for pedestrians. Sources say the traders have paid close to Rs 80 crore as parking and conversion charges. “Illegal parking is rampant in the market, but the corporation has not taken any action. It took them two years to start the trial of the circulation plan,” said Murli Mani, president of Karol Bagh Market Association. Delay in implementation After debating over plans to solve the mess since 2010, traffic police and North Corporation conducted a trial early this year. Five roads were made one way while Ajmal Khan Road was converted into a pedestrian-only zone for March-April. After the successful trial, traffic police had asked the corporation to provide enough parking space near Karol Bagh where visitors can park the car before entering Ajmal Khan Road on foot. “We had asked for road engineering changes so that the scheme can be implemented without constant supervision of traffic by marshals,” said Garg. But in a UTTIPEC governing body meeting in September, it was found that the corporation was yet to take up three off-site parkings and had not demarcated any parking on the road. The consultants for detailed engineering drawings for street design and development of Ajmal Khan Road and all approach roads were also not approved. The chief engineer claimed the detailed proposal would be submitted within three months and implemented within a year. “This project was taken up as a special project of pedestrianization of the area as per the LG’s decision to make Delhi pedestrian friendly. It is for the implementing agency to take the lead in executing such an important project,” said UTTIPEC director Ashok Bhattacharjee. Way forward The corporation, however, has no funds for it. “We will ask the Centre to fund the project,” said Chandolia. In the meantime, traffic police will consider identifying some stretches for implementing aRs 600 fine for illegal parking.